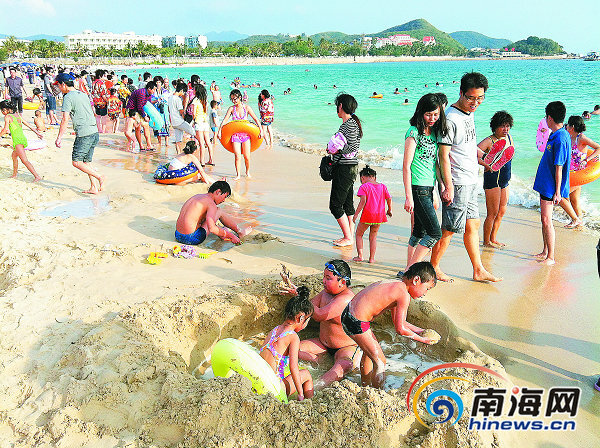 The Sanya tourism market continues to be hot despite the end of the weeklong 2012 Spring Festival holiday, reports hinews.cn. The ccupancy rate of hotels in Sanya Bay, Dadonghai, Yalong Bay has seen a steady increase since 29th Jan, the end of the Spring Festival holiday. Some even record full ccupancy rates. At the same time, scenic spots in Sanya received more tourists than the holiday period. The daily tourist number in Yalong Bay Tropical Paradise Forest Park reached 13,500 to 14,000 during 29th Jan to 1st Feb, compared with the 12,000 during Golden Week. Statistics from the Sanya Phoenix International Airport show the passenger traffic on 29th, 30th and 31st Jan stood at 54,000, 52,000 and 53,000 respectively. However, the average passenger traffic during the golden week stood at 49,000. As the air tickets fare and hotel room rates have returned to normal level after the holiday season, more and more people prefer to travel to Sanya during non-holiday periods to avoid overcrowding, according to the Sanya tourism office. The travel peak is expected to last till the Lantern Festival, which falls on 6th Feb this year.